Green ICT: a trade union approach (Written for UNI Global Union) This report is available in English, German, French, and Spanish. Written late 2009. You're being followed: electronic monitoring and surveillance in the workplace. (Written for UNI Global Union) This report is available in English, German, French, Spanish and Swedish. Published 2006. Another report for UNI, The use of migrant professional workers in IT, was written in December 2007. Also in French and German. The extended essay Negotiating the New Economy: the Effect of ICT on Industrial Relations explores the relevance - or otherwise - of industrial relations in a post-industrial information-based economy. It was contributed as a background paper to the ILOs World Employment Report 2001. It is available for downloading in sections, or - in unvarnished form - as a PDF. Also written for the ILO was the report Employability in the Telecoms sector. This explores, among other things, initiatives by employers and unions in the area of training and lifelong learning. The report dates from 2001 and is a PDF. An assessment of trade union usage of the internet, the report International Trade Union Activity and work of Works Councils on the internet (published Jan 2004), was commissioned by the UK Communications Workers Union for the European project int.unity. Also available in German (both PDF). I was the author of the book Information and Communication technologies in Europe: the trade union perspective, published by Union Network International (UNI) in 2002. More information about this book, including ordering details, can be found here. 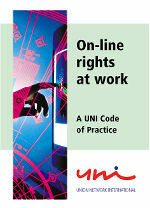 I worked closely with UNI on the development of their On-line rights at work campaign. The code of practice, launched in 2001, can be accessed here in English, German, French, Spanish and Swedish language versions. Also written for UNI was a background report on developments globally in the postal sector, Universal Development of the Post. This report is in PDF format. Versions are also available in French, German, Spanish and Swedish. Is your pay fair? On-line pay comparison services (World of Work, 2005) Also in French and Spanish.